A campaigner who lost a legal challenge to the government's academy programme has promised to carry on the fight. 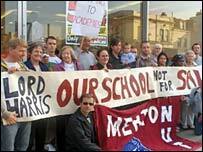 On Thursday, the High Court decided that the closure of a school in Merton, south London, to make way for an academy, should be allowed to go ahead. But Rob MacDonald, who brought the case, urged parents to contest the "privatisation" of education. He said academies were being "rail-roaded". Schools Minister Lord Adonis said he was "delighted" by the court judgement. Rob Macdonald, whose son attends Tamworth Manor school, which is set to be replaced by an academy, had been flawed. He argued that parents did not have access to the "funding agreement" underpinning the deal. This contains legal obligations on key areas such as exclusions, provision for special educational needs and admissions. But the High Court decided an academy sponsored by Lord Harris of Peckham, who already backs other academies and specialists schools, could go ahead. Another school, Mitcham Vale, is also set to be replaced under the plans. The Department for Education and Skills and Merton Borough Council back the changes. Mr MacDonald said: "We have been pitted against the overwhelming resources of local councillors, the MP, the local authority, the sponsors and ultimately the government, all intent upon rail-roading the scheme through whatever the cost." He added: "The council and its political leaders have been hell bent on forcing through these academies what ever the opposition." The government has set a target of having 200 city academies open or under construction by 2010. So far, 27 have opened. Under the scheme, private sponsors provide up to £2m towards start-up costs, giving them a say in the academy's running. The stated aim is to raise standards in deprived areas. Mr MacDonald said: "Nationally we believe our strong campaign will have an affect and we hope that future academy proposals will now ensure that the relevant information is disclosed to those being consulted. "We strongly urge parents, school staff, unions and the communities as a whole across the country to organise yourselves as soon as possible." On Wednesday, Hayley Powers, whose children attend St Mary Magdalene Church of England Primary School in Islington, north London, lost her case against its proposed replacement with an academy. She had argued the move would weaken the rights of parents and pupils. Following Thursday's ruling, Lord Adonis said: "I'm delighted that this judgement will mean that the two academies in Merton will open as planned in September. "The independent schools adjudicator was right to approve the new academy proposals as the best solution to providing higher standards for the parents of Merton and the court has cleared any obstacle to this."